Here I set out one such asymmetrically stereospecific scheme, which is the first part of a reaction used to make both natural and un-natural configurations of aminoacids; the Strecker synthesis. It makes use of a natural product based on the camphor ring system which nature provides as a single enantiomer. It is converted to an oxaziridine, and this reagent is now used to transfer one oxygen atom to an imino-thioether (DOI: 10.1021/ja00030a045). The result is the formation of a single S(S) enantiomer (the enantiomeric excess is > 98%) of a sulfoxide. In the second stage, cyanide is then delivered asymmetrically (i.e. to one face rather than the other) of the C=N group, the precursor to forming a pure enantiomer of an amino acid. Here we will probe why the first reaction, the asymmetric oxygen atom delivery, is so specific. It would be fair to say that this reaction was probably originally designed with no fundamental understanding of how it might achieve its magic asymmetric delivery. For example, those two chlorine atoms on the camphor ring look as if they were selected by trial-and-error. What indeed IS their role? Steric? Electronic? Other? If you click on the diagram above, a rotatable 3D model should appear (a static version is shown below). This is an AIM (atoms-in-molecules) analysis of the curvature of the electron density in this transition state (see DOI: 10042/to-4929). To help you navigate, arrow 1 is pointing to the small purple sphere representing the BCP (bond critical point) for the forming S…O bond. Three more purple spheres are highlighted with a halo. One of these is pointed to by arrow 2 below (to see the other two, you really will need the 3D model). This represents a BCP which appears between the hydrogen of the N=CH group and one of the oxygen atoms of the sulphone group. The label indicates the electron density at that point (0.017 au). This is characteristic of a hydrogen bond, albeit an unusual C-H…O type (a type that is too rarely invoked when explanations of stereospecificity are sought), and the density indicates its a reasonably strong one! In fact, two more BCPs can be located between this H and other groups, and they too are marked with halos. The first leads to the oxygen atom being transferred, and the second to specifically one of the two chlorine atoms (there are other interactions to the chlorines as well). 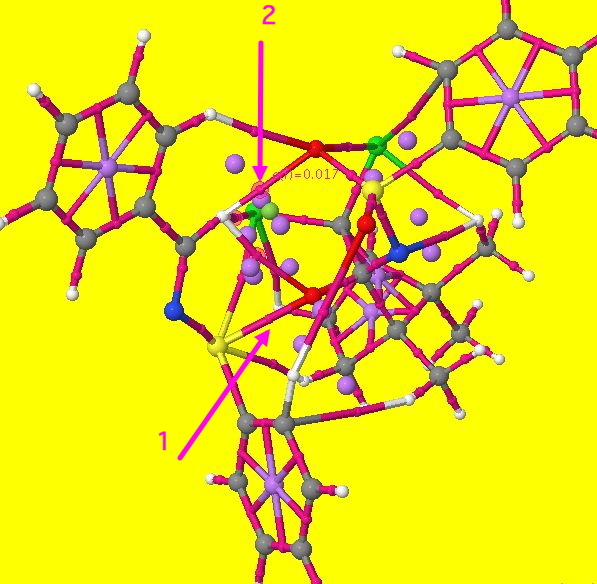 Now, it turns out that these interactions are largely absent for the alternative transition state (which would form the enantiomeric R(S) sulfoxide). Since a C-H…O hydrogen bond can easily be worth ~2 kcal/mol, it is no surprise to find that the energy of the favoured transition state is overall 2.4 kcal/mol lower in free energy compared to the isomer not formed. This represents (@300K) a ratio of 60:1 in the predicted ratio of the two species, or indeed an ee ~98%. Armed with this insight, one could design further experiments to test the hypothesis. For example, it appears only one of the two chlorines plays an active role. Replacing the passive chlorine with e.g. hydrogen might make little difference. Suppressing the hydrogen bonds by changing the N=CH to e.g. N=CF should have a big effect. The two oxygens of the sulfone also do not play equal roles. Perhaps this can be tested with a sulfoxide in place of the sulfone? All these hypotheses can of course first be tested with calculations. Of course, coming up with synthetic strategies for these new molecules might be tricky. But these experiments may give confidence (or demolish it) in the AIM technique used here to analyse the stereospecificity of this reaction. So the next time you hear a synthetic chemist proudly announce a new enantioselective synthesis, ask them what their deeper understanding of why their reaction works is. And be prepared to run away fast if they growl at you! This entry was posted on Monday, May 24th, 2010 at 3:55 pm and is filed under Interesting chemistry. You can follow any responses to this entry through the RSS 2.0 feed. You can leave a response, or trackback from your own site.